Whoville loves Christmas! Family, presents, food, decorations and so many more things all come together in one glorious celebration for the residents of this little town. 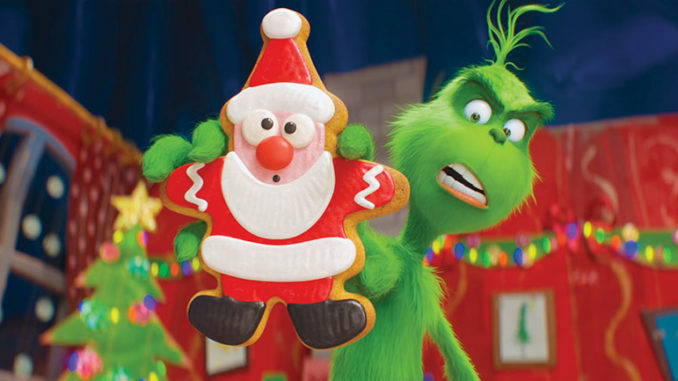 The Dr. Seuss tale returns to the big screen and is brought to life with a modern look and feel with the release of The Grinch. Despite the celebratory atmosphere around Whoville, there is one resident living high above this small town who is less than enthused about the joy that exists. That resident, of course, is the Grinch (voice of Benedict Cumberbatch). Something had an impact on the Grinch’s ability to enjoy Christmas and all that comes with it. In fact, the Grinch simply has a disdain for all the residents in the merry town he overlooks. But he has a plan to mute the enjoyment of the citizens below. He will steal Christmas. Along with his trusty “reindeer”/dog Max, he sets off to silence the revelry by taking everything symbolizing Christmas that exists in Whoville. Will that dastardly act silence these Whos, or is there more to Christmas than things? The Grinch is a tough story to crack. The 1966 version — narrated by Boris Karloff, who captured the mood so well — airs on television annually and has a permanent spot on Blu-ray in my household. Albeit only 26 minutes in length, it never felt too short to me. Then in 2000, Ron Howard brought the story to life with the chameleon Jim Carrey undertaking the role of the classic green guy. It was different but fun. Now crisply and flawlessly animated, can The Grinch circa 2018 uphold the tradition of its lead character? Well, yes, kind of. Let me explain. Where this version of the story goes right is with truly beautiful animation. The Illumination team never lets me down as they bring to life a truly magical holiday favorite. This is the type of animation that resonates with today’s youth. Musically, the new songs just feel like they are missing some of the special nature from the original effort. The songs are hip, fun and unique while dealing with the source material in an extremely respectful manner, but I wanted something else. What is tough for me is the length. As with Howard’s 2000 film, this film struggles to extend the story to feature length. Our extra time spent with the Mean One is not entirely merited. Although this iteration of Seuss’ tale doesn’t replace the spot in my heart for the original, I do have to admit this film does give me warm and fuzzy feelings about the impending holiday season. The characters bring enjoyment and love for our fellow creatures on the Earth. Its ultimate message of hope, acceptance and love is something we could all use a little bit more of in our life. The Grinch may be a mean one, but the movie is far from mean and welcomes people everywhere with a warm and inviting glow. Maybe others will have their hearts grow a few sizes after seeing this installment — one can only hope, right?